What is a Mortons neuroma and why does it occur ? A Mortons neuroma is a reversible swelling that effects the common digital nerve ( a sensory nerve to the toes ) in the forefoot area .The common digital nerve (which just supplies sensation but no motor function or movement to the toes) travels to the toes through a narrow anatomical space between the metatarsal heads and is liable to compression here , especially if the foot is “held” in shoes. If the nerve is intermittently compressed it responds by becoming chronically swollen. 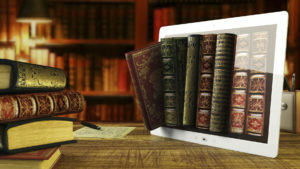 It therefore has even less space relatively in this space and is so more liable to further compression and swelling. The swollen nerve that results from this process (the Mortons neuroma) reflects a reactive process within the nerve and the nerve has the capacity to revert to its previous non-swollen state if the recurrent compression ceases (which it rarely is able to once the nerve has become swollen). The majority of cases do not require surgical treatment but if they do the neuromas can on occasion become swollen to a significant extent as shown here. What symptoms might I have with a neuroma ? The main type of symptoms a patient will have with a Mortons neuroma is one of pain. This is usually present just on weight bearing activity (standing or walking). The pain tends to be felt at the base of the toes on the underside of the foot and often, but not always, radiates down into the toes with a tingling sensation (or numbness or burning feeling). 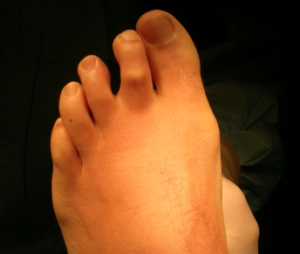 Most commonly this effects the 2nd & 3rd toes , but sometimes it may effect the 3rd & 4th toes. It is important to remember that a Mortons neuroma is only one cause of pain in the forefoot. A diagnosis is initially by examination, and finding specific tenderness in one of the web-spaces whilst compressing it. Often this reproduces the pain exactly and sometimes a click can be felt by the examiner (known as a Mulders click). The diagnosis is often confirmed by either ultrasound or MRI scanning. It should be appreciated that in a small foot with only a narrow gap between the metatarsals in the region of their heads the degree of swelling required to cause the nerve to “catch” or that results from it being compressed may be very small and not detectable by either ultrasound or MRI. A normal scan does not exclude the diagnosis. There are a number of other causes for pain well localised to the forefoot which may present with similar symptoms or co-exist with a Mortons neuroma. 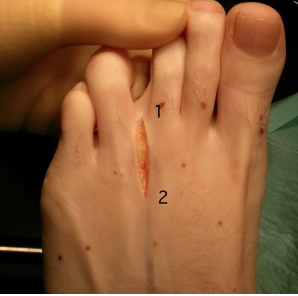 The picture above shows deviation of the second toe away from the second webspace (where there is a neuroma) and probably indicates instability of the 2nd MTP joint , which can also be associated with pain. Inflammatory tissue within the MTP joints (synovitis) can also produce well localised pain in the 2nd, 3rd & 4th toes and is best treated with an injection of steroid into the joint (during ultrasound diagnosis). Pain underneath the lesser metatarsal heads but associated with thickened skin here (callosities) as shown below is likely due to mechanical overload and may simply require the use of orthotics. In most patients the first line of management (which they’ll have tried themselves ) is adoption of shoes that ease symptoms and avoidance of painful activities. Wider fit shoes and those with good shock absorption (such as Fit Flops) can help a lot. Orthotics in theory may help by reducing load through the front part of the foot but often simply add volume into a shoe and so make it tighter and more painful. The first-line of intervention in most people is an injection into the effected web-space, often though not always under ultrasound guidance. In the clinic we use steroid and local anaesthetic. This stands a 65% chance or so of settling the problem by shrinking the inflammation associated with the neuroma. More than one may be required. Often the neuroma is more painful for a few days and can take a week or two to start settling (though usually will sooner). Thee is a small chance of infection and a small chance of thinning of the fat layer beneath the skin where the injection is inserted due to the use of steroid. This is an unusual complication and should be placed in the context of the alternative treatment which is surgical excision which will definitely leave a slight blemish with a surgical scar in every case. The operation is carried out under anaesthetic and through the top of the foot. Scars on the top heal much more readily than those on the weight-baring sole of the foot. The neuroma is easily accessed and excised in its entirety with attached normal nerve tissue. In the picture below the common digital nerve (1) can be seen to have divided into 2 digital nerves (2). The neuroma occurs at the intersection of these nerves. The operation is short (15-20 minutes) and performed as a day-case.The chance of loosing all symptoms following surgery is 65-70% and being much improved 85-90%. There is a 5-10% chance that even following appropriate surgery symptoms are incompletely resolved. Later recurrence of a neuroma after complete resolution is also described. in 1% or fewer patients. Patients may weight-bear immediately , wearing a compressive forefoot bandage for 5 days and using a basic post-operative shoe. Patients may return to normal shoe-wear after this once the bandaging is removed. A well fitting Fit-Flop shoe is especially helpful. Once in appropriate shoes and entirely pain free patients may be safe to drive. Usually this equates to a week or two post-operatively. Keep wounds dry & dressed for 2-3 weeks . If at any stage in the post-operative course the wound starts to leak serous fluid then the dressings will need frequent changes (potentially several times a day) to minimise the chance of secondary wound breakdown. At the 2 to 3 week stage the patient may generally wash the foot but should keep the incision dressed with an adhesive and breathable dressing for a further 2 weeks. The protracted use of non-breathable (waterproof) dressings often results in wound breakdown in this area due to excess moisture in contact with the skin. Avoid scar rubbing in shoe wear for further few weeks after. Cellulitis is very common if the wounds rub , even many weeks post-operatively , and patients should be warned to avoid this situation. No mobilisation regime is generally required post operatively for the MTP joints which are not operated upon. Patients should expect an early loss of any acute neuroma pain (within a week or two) but a degree of forefoot swelling and discomfort from the region of the operation will persist for 6 to 8 weeks. This equates to some pain from the forefoot in the region of the pre-operative symptoms. I advise to avoid any impact sports for 4-6 weeks depending on how the foot feels. Bike riding should be fine from 2 weeks and cross-training from 4 weeks. I had two consultations with Mark Herron and decided to have the surgery as discussed. I had extensive X-rays and ultrasound scans to determine the problems exactly..this confirmed that I had plantar plate rupture,a neuroma and some synovitis. Surgery was planned efficiently,and I was made fully aware of the process and the recovery process. I had an overnight stay and left hospital the next day…fully booted for six weeks…and the recovery process started. I had a heavily bandaged foot and a pin protruding from the realigned second toe. Mr Herron and his team(both medical and secretarial) were exceptionally thorough with all aspects of aftercare .. I confess that I was slightly squeamish at the thought of having the pin removed(after 5 weeks)however absolutely no pain at all occurred. I also had a weekly dressing change which was good as I got to see the fast improvement in the wound area. The swelling gradually improved,I was back to driving and playing golf(golf shoes and trainers are great post op support) within 6 weeks, I wore ugg boots at most other times as they were so comfortable. I also introduced gym sessions shortly after the seventh week(at a sensible level.) The pain/discomfort/restrictive footwear that I endured prior to the operation have really improved and I am delighted that I had the corrective work done. Planning the date was important to me,as I am sure it would be to everyone,as you need to be off the road for 6 weeks…but the end result is worth it. The team at the Foot and Ankle clinic are always available for reassurance,so I cannot recommend them highly enough. I now have very straight feet and can walk without pain.